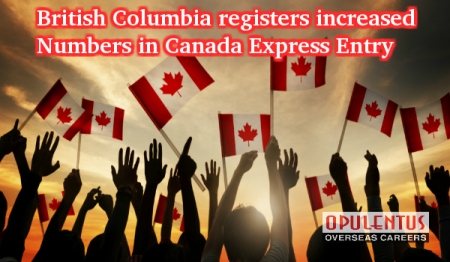 Immigration in British Columbia witnessed an increase of 586 percent when the numbers of new immigrants who gained PR by using the Canada Express Entry system since 2015 observed. 1,585 applicants succeeded in the first year, and in 2017, 10,880 candidates qualified for immigration in British Columbia by using Express Entry. Prince George attracted the permanent residents. In 2015 the numbers were 290, but they fell to 255 in 2016. In the first eleven months of 2017, the city registered a 25 percent increase and reached 320. During the last decade, the rise in the number PRs residing in the town was 129 percent. Other communities did not witness any significant increase as permanent residents. Dawson Creek had 140 PRs in both 2016 and 2017; Fort St. John saw a decline from 285 in 2016 to 250 during 2017. Kamloops also witnessed a decline PR population from 360 in 2016 to 335 in 2017 Permanent residents, unlike international students or foreign workers, are essential because they can contribute towards long-term growth and development of the community in a better manner. The contributing factors to witness increased demand for Prince George were the Language training and employment services. It was famous for international students and immigrants hailing from the Philippines, China, and India. Only 50 Syrian refugees had settled in the region between the period of 2015-2017, the increased immigration can thus attribute to the success of programs carried out under the federal and provincial skilled worker immigration. The Express Entry application system has three federal programs meant for the Federal Skilled Workers, the Federal Skilled Trades and also the Canada Experience Class. The British Columbia Provincial Nomination Program also has Express Entry streams. Applicants receive points for their age, proficiency in language; experience gained in work, education received and also the study/work experience carried out in Canada. The successful aspirants into the pool get an Invitation to Apply in the fortnightly draws (which are conducted by the federal government), as also in the provincial draws. Prince George is attractive, not only for immigrants applying for Express Entry but also for new permanent residents from the international students who pursue their studies through the local colleges/universities. The students who had graduated in the city and opted to stay by taking a work permit increased from 75 in 2015 to 120 in November 2017. These permit holders after fulfilling eligibility requirements, are in line to achieve permanent residence. The twin approach adopted to attract skilled workers by using federal/provincial programs and taking measures so that the international students apply for work permits and permanent residence accords a special status to Prince George.